For those who think that travel guidebooks are the gospel truth. As Kohnstamm comes to personal terms with each of these job requirements, he unveils the underside of the travel industry and its often-harrowing effect on writers, travelers, and the destinations themselves. Moreover, he invites us into his world of compromising and scandalous situations in one of the most exciting countries as he races against an impossible deadline. THOMAS KOHNSTAMM was born in 1975 and graduated from Stanford University with an M.A. in Latin American studies. He lives in Seattle. "A comic rogue who seems to have modeled his life and prose on Hunter S. Thompson’s… I could not get enough of the most depraved travel book of the year." "the shot heard 'round the travel world…"
"A guidebook writer reveals the truth about his trade, in detail that will shock and awe." "It’s Upton Sinclair’s The Jungle, but with tourism"
"Kohnstamm is nobody's model travel journalist, except maybe Hunter Thompson's… [he’s the] sudden enfant terrible of his field… Do Travel Writers Go To Hell? is the best-written, funniest book of travel literature since Phaic Tan." 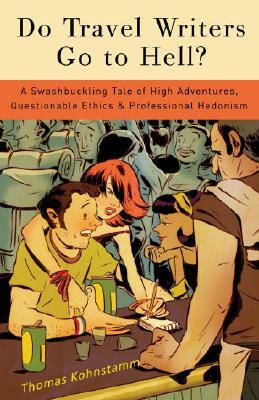 "Sharp writing and self-deprecating wit add spice to a chronicle of the sometimes absurd world of guidebook writing." "Readers will relish the countless stories of the author's misadventures, but Kohnstamm brings more than just anecdotes: He offers a solid understanding of the mechanics of the travel-writing industry and a unique ability to illuminate that world to readers. Notable for its spirited prose and insightful exploration of the less-romantic side of travel writing. Kohnstamm is one to watch."